In case you have not already seen/heard this by now, I am reposting Sharon Otterman’s article: Most New York Graduates Are Not College Ready – NYTimes.com in its entirety. If you like, you can click on the link above and read it in its original format. Frankly, this is the kind of news story that makes me weep inside. New York State education officials released a new set of graduation statistics on Monday that show less than half of students in the state are leaving high school prepared for college and well-paying careers. The new statistics, part of a push to realign state standards with college performance, show that only 23 percent of students in New York City graduated ready for college or careers in 2009, not counting special-education students. That is well under half the current graduation rate of 64 percent, a number often promoted by Mayor Michael R. Bloomberg as evidence that his education policies are working. But New York City is still doing better than the state’s other large urban districts. In Buffalo, Rochester, Syracuse and Yonkers, less than 17 percent of students met the proposed standards, including just 5 percent in Rochester. The Board of Regents, which sets the state’s education policies, met on Monday to begin discussing what to do with this data, and will most likely issue a decision in March. One option is to make schools and districts place an asterisk next to the current graduation rate, or have them report both the current graduation rate and the college ready rate, said Merryl H. Tisch, the chancellor of the Board of Regents. State and city education officials have known for years that graduating from a public high school does not indicate that a student is ready for college, and have been slowly moving to raise standards. But the political will to acknowledge openly the chasm between graduation requirements and college or job needs is new, Dr. Tisch; David M. Steiner, the state education commissioner; and John King, the deputy state education commissioner, said in interviews last week. With President Obama making college readiness and international competitiveness a top national goal, and federal and philanthropic money pouring into finding ways to raise national education standards, that equation is changing, they said. “It is a national crisis,” Dr. Steiner said. 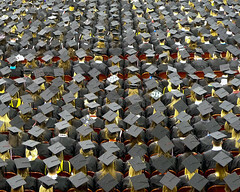 Statewide, 77 percent of students graduate from high school. Currently, a student needs to score a 65 on four of the state’s five required Regents exams to graduate, and beginning next year, they will need a 65 on all five. State officials have also begun a series of meetings in local districts to introduce this data and ask local officials what they want to do about it. A common reaction, Dr. Tisch said, is shock and hesitancy. There are fears of plummeting real estate values, as well as disagreement, particularly in rural areas, with the idea that all students need to be prepared for college. Jean-Claude Brizard, the schools superintendent in Rochester for the past three years, said that while he was surprised by the data, he welcomed the effort to move the conversation away from simply graduating. In an effort to improve, Rochester has closed half its high schools and opened new schools, including its first high school that allows students to earn credits at several local colleges. In New York City, roughly 75 percent of public high school students who enroll in community colleges need to take remedial math or English courses before they can begin college-level work. (I would argue the same is true here in Rochester. Many of my incoming first year community college students are not anywhere ready for regular Comp-101. They need a more basic English class to prepare them for Comp-101. That is what my community college is grappling with now. This semester faculty in the English Department started developing a new diagnostic tool as the old AccuPlacer was proving ineffectual. Not everyone had to take it and part-time students slipped through the cracks.) City education officials said the 23 percent college-ready rate was not a fair measure of how the city would do if graduation requirements were raised to a higher standard, because students would work harder to meet that new bar. While it has not gone so far as to calculate an alternative to graduation rates, the city has already begun tracking how each high school’s students fare in college, and in 2012 it will begin holding principals accountable for it. “Last year, well before the state announced this plan, we told schools we would begin including robust college readiness metrics in school progress reports,” said Shael Polakow-Suransky, the chief academic officer. But they are also discussing increased flexibility for districts and students, so that they can spend more time on the subjects they are interested in. For example, students might be permitted to choose at least one of the Regents exams they must pass to graduate — currently all students have to pass math, English, science, global history and American history. Students might be able to substitute foreign language, economics or art for one of the five. Or students could replace one Regents with a vocational skills test in an area like carpentry or plumbing. (Non-snarky response: I actually love this idea. Traditional education is not for everyone, and we need to value our vocational students more. Honestly, those middle and high school years are the only times in life where we expect people to be universally excellent at everything from foreign language to math to science to social studies to English to gym to sewing and cooking! People aren’t made that way. It would be great if we could allow students to specialize in their areas of interest. I mean, you could have asked me if 5th grade if I was going to be a nuclear scientist and I would have told you, “Hells bells, no!” and then I would not have had to suffer through calculus. I can honestly tell you that in my career, I have never used calculus. Ever.